Along with Search Engine Optimization (SEO) and Email Marketing, link development is a proven and effective way to generate traffic to your website. Local directories and profiles are a must for every business. We'll ensure that your business and website are listed prominently in the local directories and related sites to gain maximum exposure. Increase your search rank and website traffic with high-quality, relevant backlinks from a variety of sources. Developing incoming links from other websites into yours is crucial in building rank and traffic. So, one of the most important things you can do is to develop and attract these links. Along with the number of links pointing to your website, a key component in search rank is the quality of these links. Link-building is a methodical, time-consuming task that must be managed correctly to be effective. We offer comprehensive link development solutions, and work with each client individually to develop an appropriate strategy for their situation. What are Good sources for link-building? There are thousands of web directories on the internet, but most have little value. Our approach is to selectively submit your web site to appropriate, high-ranking website directories that yield actual value. Directory sources can include both free and fee-based directories, vertical and niche directories, general business and association directories, and finally, local directories and review sites. Increase your visibility by leveraging related sites. This is a very powerful method for increasing your visibility to to both users and search engines, but is the most difficult objective to accomplish on your own. Obtain links from high-ranking sites that are a natural fit for you. It's one of the most powerful things you can do for your site. The Internet has opened up a whole new dimension for press release optimization and distribution. You can opt for broad exposure, where a single press release can receive hundreds of thousands of views and get your business mentioned on any number of popular news sites and portals. Or, you can be more selective in who you want to reach by targeting just the right audience. In either case, online press releases offer an inexpensive, but very effective way to generate exposure for your company. The results are almost immediate. Your press releases should conform to industry standards, be well-written, and optimized for search engines. You'll also want to use the right distribution service. Spritz uses the best in the business to get our clients' releases broadcast to the right audience in a cost-effective manner. 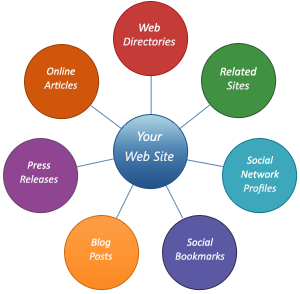 Websites can be promoted very effectively through the submission of articles. By including a link to your website within each article, you can bring targeted traffic to your site. Incoming links will also increase your Google PageRank. Spritz can assist you with creating content for your articles and optimizing your content for the search engines. Then, we'll submit submit your article to the right directories and websites, both general and niche. New version of Spritz CMS released! Faster, more streamlined, and with better integration. Upgrade has been rolled out to all subscribers. Copyright © 2012 Spritz Web Solutions, Glenview, IL 60026. All rights reserved.